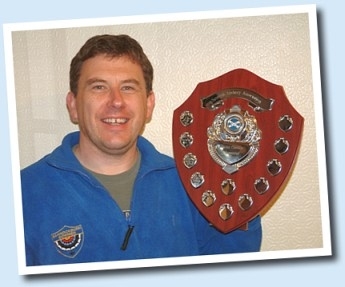 We take the opportunity to congratulate Ciaran Murphy, our Club Treasurer who was awarded the David Christie Memorial Shield at the recent SAA AGM on 6th December 2009 for services to Archery. Ciaran is a stalwart of Bannockburn Bowmen and one of the main architects of the Club in its current successful form. Almost every archer within the Club has been assisted by Ciaran at some time through his patience and wealth of experience. He was awarded life Honorary membership of Bannockburn Bowmen in March 2008 in recognition of his achievements for the Club on the shooting field and off. Nevertheless, he was greatly surprised by the award from the national governing body of Archery!